Americans love creamy spinach dip, sometimes made with added artichoke hearts (here’s a rich and lovely spinach and mascarpone dip recipe). But there are other types of spinach dip, some even better for you. Here’s a Georgian-style dip—actually more of a spread, which is chock-full of walnuts for protein and made with no cholesterol or added fat. That’s Georgia, the country in the Caucasus region of Eurasia, and part of the former Soviet Union. This recipe was created by California-based chef Boris Portnoy for the California Walnut Board. Chef Portnoy, of Georgian ancestry, notes that this dish originated in Georgia but has been adopted in other parts of the Caucasus. The name for the spread is pxali, a general term denoting a spread or dip that can be made from a variety of vegetables. Spinach is traditional. The dip is green if spinach is used, red if beet leaves are used or white if young cabbage leaves are chosen. A different type of spinach dip. Photo courtesy California Walnut Board. Whatever the vegetable, the dip/spread is always bound with a rich walnut paste into a thick mass, which can be used as a side dish at dinner or a main dish for lunch served with bread or lavash. It is best made a day ahead, so the flavors can develop more fully. *Ground mustard seed can be substituted. Fenugreek is in the spice section. If your supermarket doesn’t carry it, check international markets or buy it online. ground. Photo courtesy Malaysian Kitchen. 1. CHOP the walnuts finely in a food processor, until they are the consistency of coarse breadcrumbs. Transfer to a large bowl. 2. PLACE the spinach in a large pot, cover tightly and cook over moderate heat, stirring once or twice, until the leaves are wilted. (Alternately, microwave the spinach in a covered bowl until wilted.) Rinse the spinach with cold water, which cools it and stops the cooking. Squeeze the moisture out of the spinach, a handful at a time. 3. 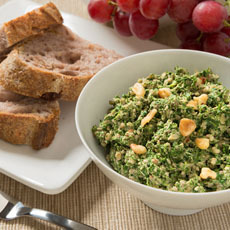 CHOP the spinach finely in the food processor as well, and add to the walnuts. Stir in the garlic and water. Add the vinegar, coriander, fenugreek, chili flakes, cilantro and parsley to the mixture and blend thoroughly. Season with salt to taste. If the spread seems too thick, add more water, 1 tablespoon at a time, to achieve the desired consistency. 4. TRANSFER to a serving dish and garnish with pomegranate seeds and parsley. Serve with flatbread, crackers or sliced rustic bread. Makes about 3 1/2 cups dip. 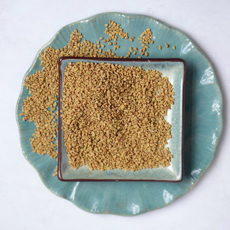 Fenugreek is a plant that was likely first cultivated in the Near East. The oldest samples have been found at an Iraqi archeological site, carbon dated to 4000 B.C.E. Seeds were also found in the tomb of King Tutankhamen. The largest producer today is India, with Afghanistan, Argentina, Bangladesh, Egypt, France, India, Iran, Nepal, Morocco, Pakistan, Spain and Turkey also major producers. In India, the seeds are used to make daals, pickles, spice mixes and vegetable dishes. They are often roasted to reduce bitterness and enhance flavor. Fresh fenugreek leaves are used in some Indian curries; sprouted seeds and microgreens are used in salads. The sweet-smelling plant produces an herb (dried or fresh leaves), a spice (the seeds, which are used whole or ground), and a vegetable (fresh leaves, sprouts, and microgreens). A member of the Fabaceae family of agricultural and food plants, fenugreek’s relatives include alfalfa, beans, carob, chickpeas, licorice, peas, peanuts and soybean.